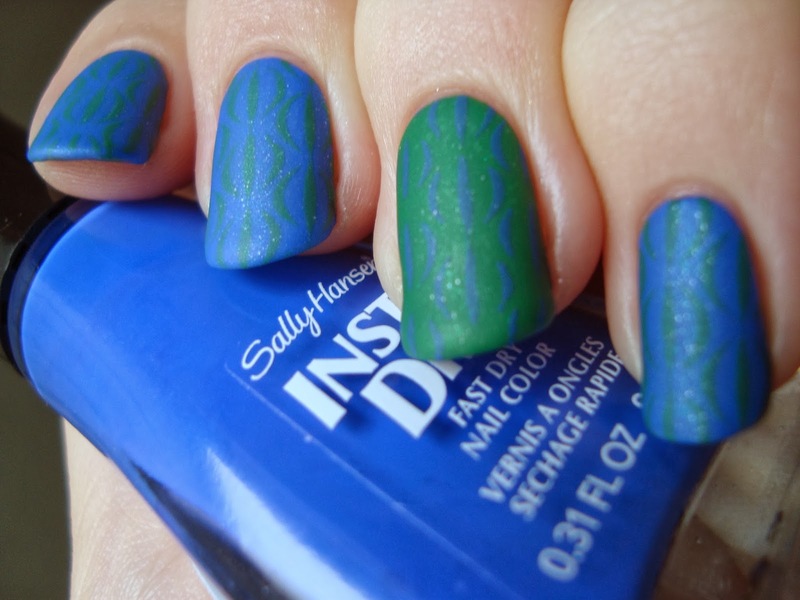 Sally Hansen Insta-Dri polishes have a reputation as great for stamping, and it's well earned. I can't vouch for all of them, but any time I've tried one it's worked beautifully. When I found the new core shades I was especially excited about the vibrant In-prompt Blue. It's along the same lines as Pacific Blue from their Xtreme Wear line and the idea of having a version to stamp with was thrilling! It's especially tough to find good creams for stamping, so I had to put the new three to the test...and the foil and shimmer while I was at it. Like I need and excuse to stamp! It wasn't intentional, but all of the results remind me more than a little of polyester shirts. 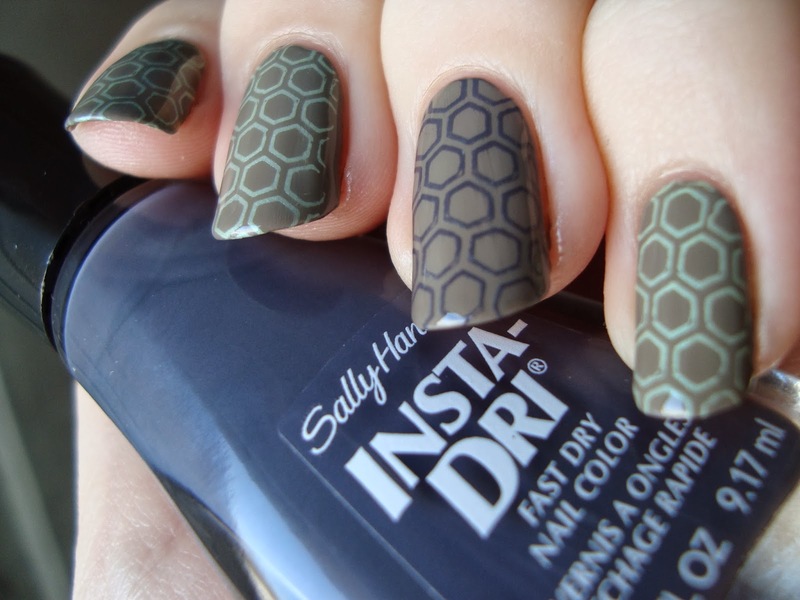 I stamped a geometrical honeycomb pattern from Bundle Monster's BM-422 plate with Chartreuse Chase and Grease Lightning over Sephora by OPI Dance Til Fawn. I found Dance Til Fawn at Big Lots recently for just $1.80. Yay! It'll get a moment in the spotlight on its own eventually, but I'll tell you this much now...one coater! Back to the Insta-Dri's though, both stamped very well, as you can see. I screwed up just a little, but I still like how it turned out. I mattified it too, of course. It looks like the intersection of a turtle and a woman's sneaker...but in a good way. 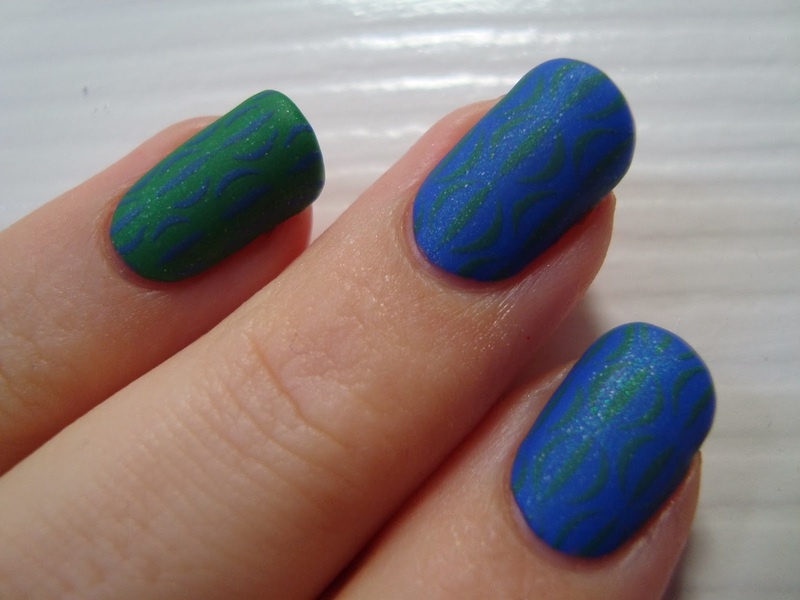 I stamped with I-rush Luck over In-prompt Blue and reversed it on the accent, using MoYou's Back To The '70s - 02 plate. I had the pinprick bubbling that I mentioned in the review yesterday, so I disguised it with a subtle green shimmer from an old "round bottle" Sation called Deluxe Crystal Top Coat. When I mattified it the shimmer became much more visible and the whole design stood out more. You can see it better at a different angle. I wanted something bold to contrast the bright yellow gold of Go For Gold, so I stamped it over Cult Nails Nevermore (thanks, McGee!) with the MoYou Back To The '70s - 02 plate again. I started off with just an accent. I loved the accent so much that I had to bring it to the rest of the nails. I didn't line the pinkie up right at all. Oh well! I also have to put in a word for just how great Nevermore is! FingerPaints Black Expressionism is still my favorite brick & mortar black, but Nevermore blows it away. I've used a lot of black polishes over the years and this is the king! It even stamps well. Back to Go For Gold though....perfection, as you can see. 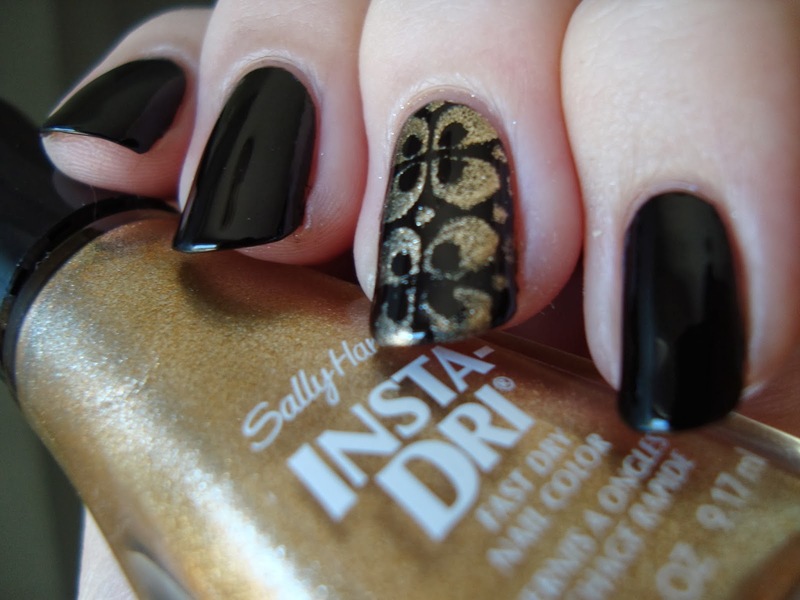 Foils usually stamp well enough, but Go For Gold was effortless and the result was generally very sharp and clean. I won't say it came out perfectly, but it's quite good. I love it even more mattified. Bottom line: All five stamp very well! That's not surprising for a foil like Go For Gold, but it's a pretty rare thing for creams in my experience. I'd recommend all five if you're looking for more stamping options.